Locate your Pushwoosh Application Code. Chrome and Firefox: locate your Firebase API key and Sender ID. To do so, please follow steps 1-3 of Android configuration guide. Safari: locate your Website Push ID. Download Pushwoosh Web Push SDK. Chrome pushes will not work with self-signed certificates (https/ssl). You'll need SSL certificate signed by trusted Authority. Push notifications don't work in Incognito mode. 2.1. Change name and short_name to the name of your website. 2.2. Change gcm_sender_id to your Sender ID. Please keep in mind that Sender ID is usually a 12-digit number, and it can't contain any letters. 3. Place all these files to top-level root of your website directory. 4.1. Include manifest.json in <head> (not <body>). Make sure <link rel="manifest" href="/manifest.json"> is located above other <link rel="manifest" ...> in the <head>, or it won't be found. 4.2. Include the SDK from our CDN asynchronously. Click here if you are using Google Tag Manager. 4.3. Initialize the Web Push SDK and make sure to queue the initialization until the moment the SDK is fully loaded. To prompt your users to subscribe for push notifications, we recommend implementing a push subscription button on your website. Enhance user experience and get more subscribers! To get FCM sender ID and API Key, please follow steps 1-3 of the Android configuration guide. If you can place the files in a subdirectory of your website only, for example, yourdomain.com/push-notifications. Place manifest.json and pushwoosh-service-worker.js into the subdirectory and follow the steps 2 - 4.2 of the standard guide. Modify the configuration (step 4.3) by adding a parameter serviceWorkerUrl: “/push-notifications/pushwoosh-service-worker.js” where /push-notifications/pushwoosh-service-worker.js is the path to pushwoosh-service-worker.js file. Add the mechanism that redirects users to this subdirectory on your site like yourdomain.com/push-notifications/index.html. Make sure to set up our SDK in the subdirectory as well! Add the button that registers users for pushes. Use this guide to implement the subscription button. Alternatively, you can use auto subscription using autoSubscribe: true parameter of Web SDK initializer. Use the Event listener onPermissionGranted (reference) in order to redirect user back to the main page when he succeeded with the subscription. In Pushwoosh Web SDK 3.0 you can subscribe to certain events to track them. The first argument in each callback is an API object. // Executed after successful SDK initialization. // Executed after a user agrees to receive push notifications. //  Executed after a device is unregistered from notifications. // Executed during the SDK initialization if 'autoSubscribe: false' or/and if a user ignores a push notification promt. // Executed during the SDK initialization if a user blocks push notifications. // Executed during the SDK initialization if a user allows push notifications. You can also find the additional information about the push notification, such as the message hash or the URL that was opened once user had clicked the notification. // Executed when a push notification is displayed. // Executed when a user clicks on notification. // Executed when a push notification is closed. // Executed after the Inbox is updated automatically while the page is loading. // Executed by ServiceWorker after the Inbox Message is received and saved to indexedDB. After the Web Push SDK is initialized, you can make the following calls to Pushwoosh API. All the methods return Promise objects. This method is used to request a user's permission for push notifications. If a user is already subscribed, the method will stop executing. 1. Permission for push notifications is requested. 2. If a user allows notifications, onSubscribe event is triggered. Pushwoosh.subscribe() is executed automatically if autoSubscribe: true. is set during the SDK initialization. Checks if a user is subscribed and returns true/false flag. Returns push token if it is available. Returns User ID if available. Returns the number of opened messages. Returns the number of unread messages. Returns the total number of messages. Loads the list of undeleted messages. Marks messages as read by Inbox_Ids. Performs the action assigned to a message and marks the message as read. Synchronizes messages with the server. 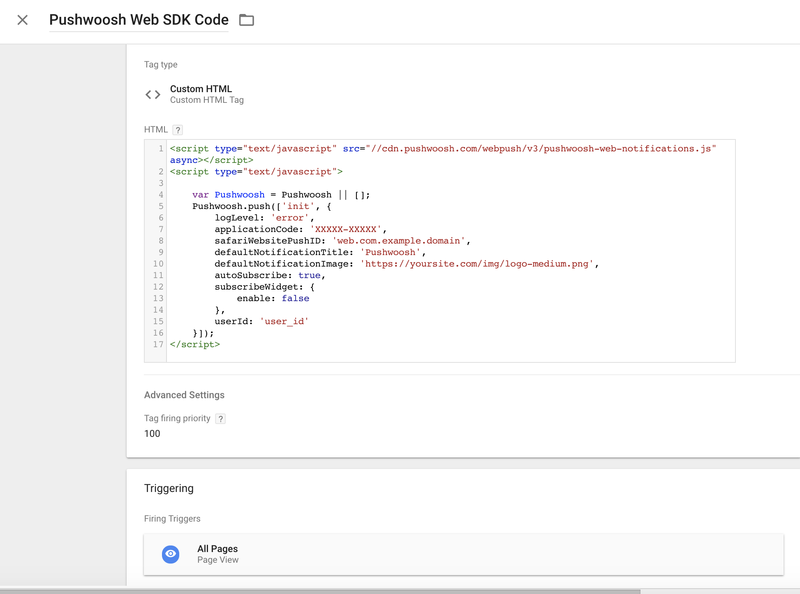 The latest version of Web Push SDK 3.0 supports PWA out of the box. There is on thing to keep in mind if you would like to use our WebSDK with PWA - service workers initialization behaviour. If PWA and WebSDK scopes does not intersect with each other, then everything will work without additional changes. ServiceWorker compatible with a package version is located in node_modules/web-push-notifications/lib/service-worker.js only for Web Push SDK 3.2.7 and higher. Please note that interactions between Web Push SDK and ServiceWorker could differ for different versions, so it’s essential to use the ServiceWorker compatible with the Web Push SDK version you use. Make sure to follow this guide's steps 1 to 4 before adding the script to Google Manager Tag!